Fokker Dr.1 1:72 [10Rev04116] - £5.99 : Hobbies and Collectables Online, more for your money! 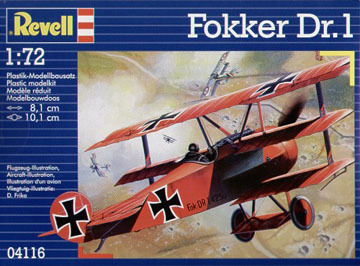 The Fokker Dr.1 was inspired by the Sopwith Camel and like that aircraft the Fokker also was a very maneuverable aircraft. It's service life was only relatively short but in that period it gained a reputation as a very deadly fighter.